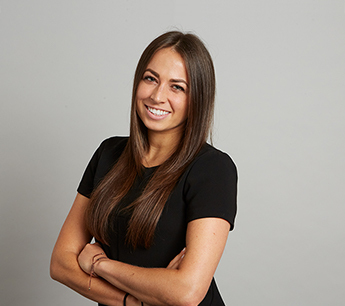 Jordyn Comras joined RKF in 2015 as a Canvasser in the firm’s New York office and was quickly promoted to Associate. She supports the New York leasing team on both landlord and tenant representation projects by actively seeking out new business opportunities, updating the mapping and listing databases and collecting pertinent marketing materials. Jordyn is currently the leasing agent for 725 Madison Avenue, 935 Madison Avenue, 1140 Third Avenue, 1220 Third Avenue, 1588 Third Avenue on the Upper East Side, 79-97 Seventh Avenue in Chelsea (Jensen-Lewis) for the retail at the new Four Seasons Downtown in the Financial District and 120 Broadway and 120 Wall Street on behalf of Silverstein. She also helps advise Lefrak in launching a new retail plan for their portfolio of properties in Manhattan. Her most notable recent transactions include leasing approximately 4,600 SF at 1515 Broadway to LINE Friends for their first U.S. flagship store and leasing 30 West 18th Street to a Michelin star chef for his first restaurant venture. Prior to joining RKF, Jordyn interned at Vornado Realty Trust during the summers of 2014 and 2015, where she conducted lease analyses, drafted LOIs, and aided in the valuation of over 2.4 million square feet of retail space for annual budget analysis reports. In the summer of 2013, she worked in the leasing department at Kering, where she assembled retailer lists, performed market research, and became familiar with the brands specific needs. Jordyn graduated from New York University in May 2015 with a Bachelor of Arts degree in Urban Design and Architecture Studies and a minor in Business Studies. She is a licensed salesperson in the state of New York.